With no shortage of drama, the Rice baseball team rallied for the winning run in the bottom of the ninth inning to claim the 2017 Conference USA Championship with a 5-4 victory over No. 11 ranked Southern Miss May 28 in Biloxi, Miss. Owls watch NCAA selection show on Memorial Day. Photo by Tommy LaVergne. Now in the program’s 12th season of playing in Conference USA, Rice has won the league’s championship final seven times (as well as played in the title game two other times). The Owls also claimed C-USA’s automatic bid to next week’s NCAA Tournament, keeping alive a streak of advancing to national postseason play for what is now 23-consecutive seasons. On Memorial Day morning, the Owls gathered at the Gorgeous Gael in Rice Village to watch the NCAA selection show on ESPN2. The Owls learned they would be headed to the Baton Rouge (La.) regional again. 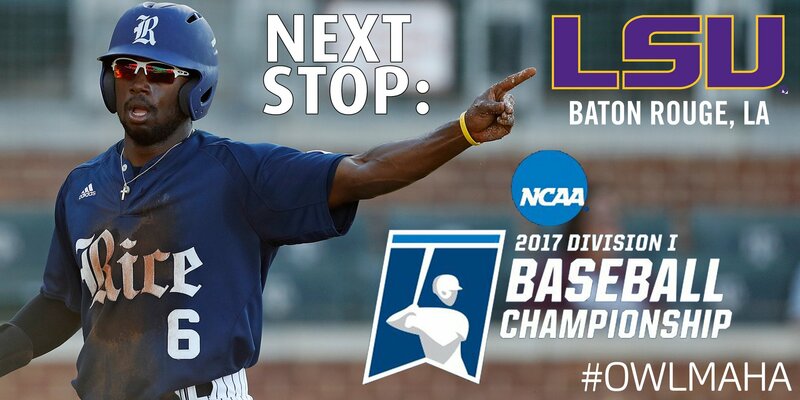 The Owls played in the regional at LSU last year, enduring weather delays and postponements for the better part of a week and ended their 2016 season in a 5-2 loss to the LSU Tigers in a game seven winner-take-all. Entering the C-USA Tournament as the No. 6 seed, and the title match just one game above a .500 record (30-29), Rice knew the only way to keep the NCAA Regional streak alive was to win the automatic bid. The Owls certainly fought all the way to the very end. With the score deadlocked 4-4 to start the bottom of the ninth inning, Rice designated hitter Andrew Dunlap led off by punching the first pitch for a base hit through the left side. Kendal Jefferies was brought in to pinch run at first base, and he advanced to scoring position on Dayne Wunderlich’s textbook sacrifice bunt. At that point Southern Miss elected to change pitchers as Owl veteran Ryan Chandler approached the plate. The junior centerfielder blasted a 1-1 pitch over the USM centerfielder’s head, and Jefferies dashed home with the winning run. Chandler’s game-winning hit was one of three he had on the day, and part of a 12-hit attack overall. Every Rice starter had at least one hit in the game, but it was another sensational performance from pitcher Glenn Otto Sunday (and all tournament long) that resonated the most. With the season on the line Sunday, Otto held C-USA’s top hitting team to no runs on just two hits with five strikeouts for five innings. In three tourney appearances over the week the junior right-hander did not allow a run for a combined total of 9.2 innings where he registered two wins and a save, along with 11 strikeouts. Otto was named the tournament’s most valuable player, leading Owls’ Dane Myers, Charlie Warren and Matt Canterino on the 2017 all-tournament team. With a raucous Southern Miss partisan crowd of 5,216 in Biloxi, the Golden Eagles opportunistically took advantage of a Rice miscue for a run in the top of the third inning. Matthew Guidry reached on a leadoff walk and moved to scoring position on a sacrifice bunt by LeeMarcus Boyd. Guidry went to third on a two-out infield single by Tyler Irby, but then took an extra 90 feet to home on an Owl fielding error on the play. Golden Eagle centerfielder Matt Walner then led off the fourth with a solo home run. His Conference USA-leading 19th homer made it 2-0. At the completion of the inning, the game entered into a 52-minute weather delay. When action resumed, Ryan Chandler led off the fourth with a triple to right-center. Three consecutive singles from Ford Proctor, Dane Myers and Dominic DiCaprio plated Chandler while loading the bases. Southern Miss was able to turn a double play, but Proctor dashed home for the tying run, 2-2. Southern Miss came right back with two runs in the fifth, one aided by a second Owl fielding error of the game. Mason Irby then doubled to add another to reset the margin at two, 4-2. Rice wasn’t finished and rallied to tie it in the seventh. Darryn Sheppard led off with a single, Charlie Warren reached on a USM fielding error, and a one-out walk to Dayne Wunderlich loaded the stations. Sheppard scored on a wild pitch and a Chandler single evened it up 4-4. The blue and gray looked to have taken the lead as Wunderlich slid home on play at the plate, only to be called out with no chance to review. In the top of the ninth it was Wunderlich who gave the Owls an emotional lift with a defensive play in left. USM hit a towering fly ball to left that Wunderlich gave the visual impression it might go for a Golden Eagle home run and a 5-4 deficit. At the last moment, however, Wunderlich raised his arm and nonchalantly caught the ball with his back at the wall. The crowd went quiet and the play seemed to spark the Owls on the offensive side in the bottom of the ninth, and secure the program’s 21st conference championship. Rice is now 31-29 overall. Southern Miss is among the national win leaders at 48-14 on the season. The Owls will open NCAA Tournament play at 7 p.m. June 2, against Southeastern Louisiana.